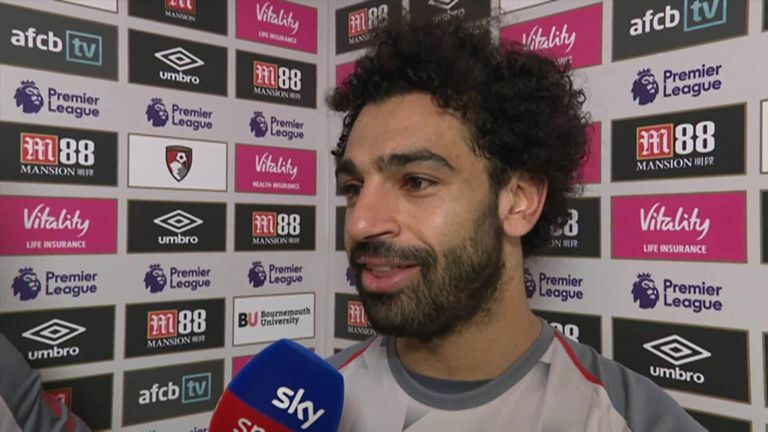 Mohamed Salah scored a hat-trick as Liverpool went to the top of the Premier League with a 4-0 win at Bournemouth. Having not scored in three games, Salah gave Liverpool a controversial lead (25), converting from close range having been in an offside position as Asmir Begovic fumbled from Roberto Firmino's effort. But there was nothing contentious about Salah's second (48), slotting into the far corner after Steve Cook had handed the ball to Liverpool high up the pitch, and Cook's day got worse as he put through his own net for the third (68). 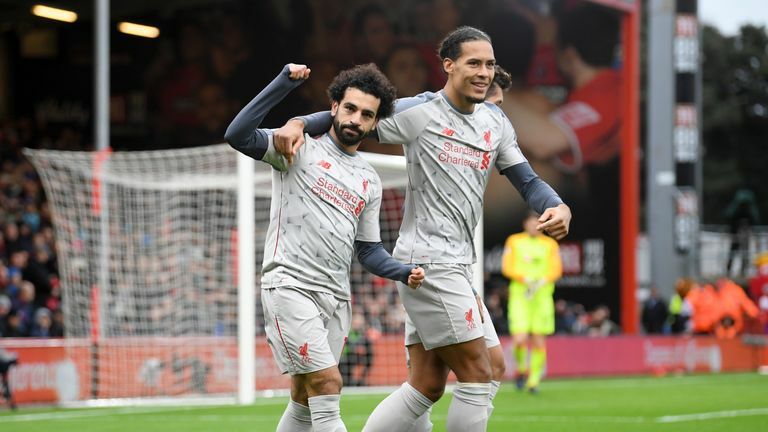 Salah then got his third, rounding Begovic twice to coolly slot home (77), and the Reds remained top of the league at the end of the day as Chelsea ended Manchester City's unbeaten run with a 2-0 win at Stamford Bridge. The win also means Liverpool matched their record of 17 Premier League games unbeaten, set in 2008. 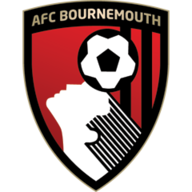 Despite Liverpool dominating the early possession, Bournemouth forced Alisson into the first save as David Brooks saw his shot from a tight angle beaten away at the near post. But Liverpool took the lead on 26 minutes as Firmino's dipping half-volley from the edge of the box proved too hot for Begovic to handle, squirming out for Salah to convert from close range. However, replays showed Salah was fractionally offside from Firmino's shot. Top scorer Callum Wilson missed out for Bournemouth due to injury, with Stanislas coming in. Surman also replaced Cook. Liverpool made five changes; Alberto Moreno drops out of the 18, Joe Gomez is injured, and Andy Robertson came back in. 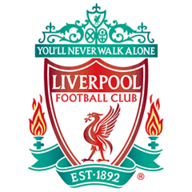 Jordan Henderson dropped to the bench, Fabinho and Georginio Wijnaldum started, while Divock Origi and Daniel Sturridge were replaced by Mohamed Salah and Roberto Firmino. Outside of the box, Salah's touch was amiss for the first hour, but the Egyptian was back to his deadly best inside it. After Cook had given Firmino the ball on a plate on halfway, the Brazilian fed Salah, who stayed on his feet after a cynical Cook tackle before rolling it into the far corner. Josh King, in for injured top scorer Callum Wilson, could have halved the deficit soon after, but didn't get his shot away from close range, seemingly expecting a challenge from Alisson. Cook then turned into his own net midway through the second half, hooking Andy Robertson's left-wing cross behind him and beyond Begovic's grasp as the defender attempted to clear. And Cook's day to forget was capped off late on as he struggled in a foot race with Salah, made a hash of his sliding clearance, and allowed last season's top scorer to round Begovic twice and poke home nonchalantly for his 10th league goal of the season. 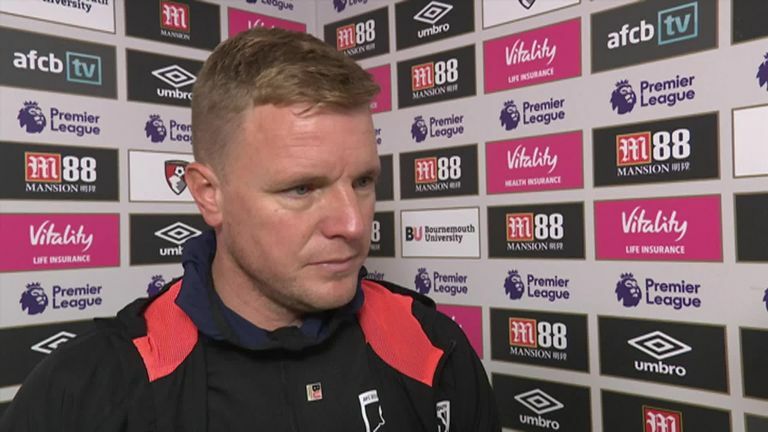 Eddie Howe on offside opener: "It was a tough game. The first goal was a real key moment in the match. Up until that point, I thought we defended well, our shape was OK, we kept them away from our goal and, and Salah is offside. "The goal shouldn't stand, and in these games, when you're playing the big guns, you need these decisions to go in your favour. 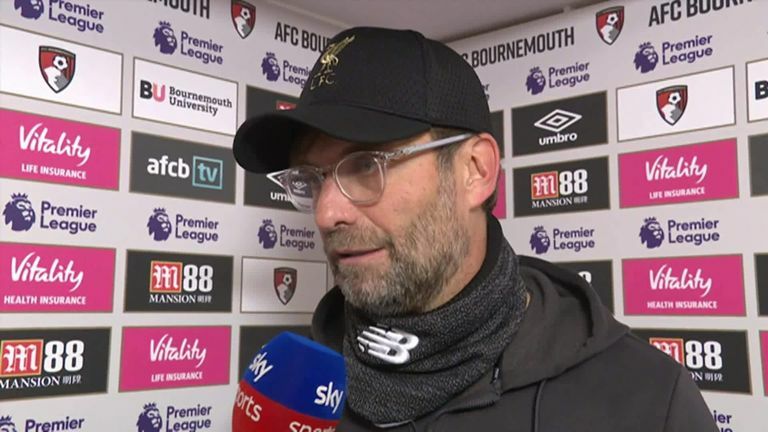 Jurgen Klopp on title challenge: "I do think the only way to be successful is to be completely focused on yourself, that's what we try to do. It is quite difficult because people ask us about other teams, we are not really interested in that but we give answers because we are polite!" "Liverpool are purring right now, and if they can get through on Tuesday [in Champions League against Napoli], keep going in the Premier League, they can hang onto Man City's coat-tails. "Virgil van Dijk can wear his kit on Tuesday night, it was that clean. Liverpool never got out of second gear, it was so comfortable in possession. When you've got a player like Salah, he can take a game away from any team." Since the start of 2015/16, Bournemouth have scored more own goals in the Premier League (8) than any other side currently playing in the division. Liverpool have accrued 42 points from their opening 16 league games of the season, their best-ever tally at this stage of a top-flight campaign. James Milner made his 500th Premier League appearance in this match, the 13th player to reach this landmark and the second youngest to do so (32y 338d), behind only Gareth Barry (32y 219d). Bournemouth's Asmir Begovic has made eight errors leading directly to a goal in the Premier League since the start of 2017/18, more than any other player. Since the start of last season, only Lionel Messi (43) has scored more league goals in the big five European leagues than Liverpool's Mohamed Salah (42). You sense this was just the tonic for the Egyptian, who had not been at his blistering best of late and even looked sluggish in the first half. Though his first came fortuitously, and from an offside position, his second was a class act. Not many would stay on their feet as Steve Cook attempted to hack him down from behind, and Salah's directed finish into the far corner was trademark. By the time the third goal game, Salah's confidence was back. He rounded Begovic not once but twice, before teasing the Bournemouth defenders as he poked home. He even offered James Milner the man-of-the-match award after the game, on the midfielder's 500th Premier League appearance. If Liverpool want this league title, they need Salah in this form. Liverpool now host Napoli in their final Champions League group clash on Tuesday night, before hosting Manchester United on Super Sunday, live on Sky Sports Premier League at 4pm. Bournemouth go to Wolves on Saturday in the Premier League at 3pm.